1. Click the Number Line icon and drag it to the display are. 2. Right click on the Number Line to display and adjust the settings. 3. Click one of the arrows at the end of the Number Line to adjust the length. 4. Click the '+' or '–' to adjust the step. 5. 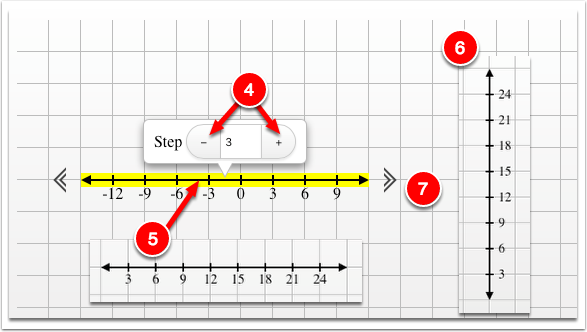 Drag the number line to change the position of the numbers. 6. Double click the Number Line to rotate. 1. Click the '+' or '–' tiles and drag it to the display area. 2. Click the '+' or '–' to change its color to gray. 1. Click the 'Colored Arrow' icon and drag it to the display area. 2. Click on the 'Colored Arrow' and hold -OR- right click to view the settings. 3. Click one of the arrows at the end of the icon to adjust the length. 4. Click the 'Change color' button to change the color of the toothpick. 5. Select the tip you want to use. 6. Double click the 'Colored Arrow' icon to rotate. 7. Click and drag the 'Colored Arrow' icon to move.